Six months on and the café remains, however it is now under the care of Hampshire homelessness charity The Society of St James. The regional charity won a five-year contract to run the lodge – now named Café in the Park – following a successful tender to provide employment and training opportunities for vulnerable adults; and Portsmouth City Council invested £100,000 to refurbish the site. Conservative councillor Donna Jones, leader of Portsmouth City Council, announced in May that the Council was ‘carrying out extensive works to deliver improvements that will provide one of the best facilities in the south for adults with learning disabilities. The Cafe in the Park opened on the 14th August with surprisingly little fanfare from Portsmouth City Council. For full disclosure, I have to own my bias towards the previous operators of the Arts Lodge. I shared many good memories there, at events like the Winter Solstice celebration, or visiting with dates. 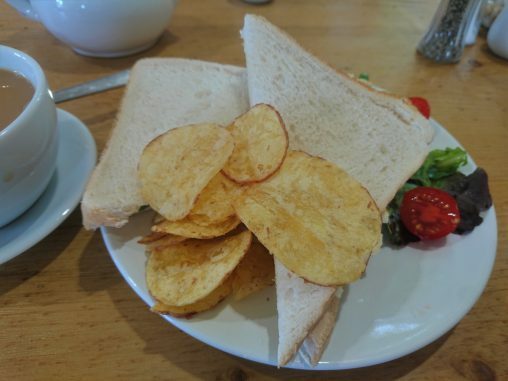 As a food critic, it’s fair to say that the Arts Lodge café wasn’t renowned for its food, but the atmosphere and colour of this venue was well-loved by many regular users in the community. It was a not-for-profit venue, a free space for anyone to use for meetings and gatherings, and a well-loved arts exhibition and performance space. On a personal level, I was very sad The Arts Lodge closed. However, I was curious to see what would follow in its place, particularly after hearing that the facility would offer services alongside employment and volunteering opportunities for adults with learning disabilities. I was particularly glad that corporate giants like Starbucks hadn’t taken the site over and keen to see how the Council’s sizable investment had transformed the property. I visited the new café on a Friday afternoon, 4 days after it opened its doors. The left-hand, exterior brick wall has been removed to create an open and light courtyard, peppered with picnic benches. Although very different to its predecessor, it’s a quaint, lovely space. Inside, the white walls, large windows and wooden tables complement a ‘shabby chic’ décor: with a large rustic clock on the wall, planters, a vintage globe and a large metal spoon hanging by a window. The feel of the Café in the Park is entirely different from The Arts Lodge, and while I’m certain many people will like the new style, it does mirror many other places in Portsmouth. Perhaps it’s my bias, but I preferred the wackiness of flowers planted in Doc Martens in the old Arts Lodge and the vibrancy of local art hung on the walls. It was unique. Portsmouth City Council state that the Café in the Park will also be a ‘creative exhibition space’, but there was no artwork on display when I visited, leaving the space feeling bland by comparison to my previous visits to The Lodge. The Society of St James (SSJ) has partnered with the Bean Bag Café to operate a community cafe, giving full-time employment to 3 adults and volunteer positions to another 10. The charity already provides treatment services and specialist housing to homeless people in Portsmouth, and their plans for the cafe aim to support their existing provision: delivering ’employment and training opportunities to local people with histories of homelessness and substance misuse’. However, it seems likely that residents who have lost trust in Portsmouth City Council following the departure of the Arts Lodge will be unhappy that the Council’s stated reason for closing the former facility have not come to fruition. Sadly this also places increased public pressure on the new operators, which may be part of the reason for their somewhat understated opening. The Café in the Park has a large menu, offering paninis, sandwiches and jacket potatoes at reasonable prices – less than many other cafes in Portsmouth – alongside breakfast options (available until 11.30am) including a Full English and a bacon and egg bap. I was a little disheartened by the time limit on the menu when I visited at 1pm, as I really craved a bacon sandwich. I asked if they could make an exception as some of the lunch options included the same ingredients, like the brie and bacon panini. However, when a member of staff told me they couldn’t make me a bacon sandwich, I ordered an egg and cress sandwich instead and a pot of Breakfast Tea. 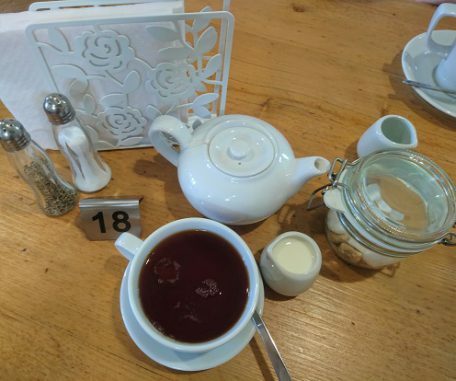 I wasn’t impressed when I was given Earl Grey tea and the egg sandwich was disappointing: served on plain white bread which wasn’t freshly baked, and including a few mouthfuls of egg shell. It was ok, but I was more impressed that the staff were so warm and friendly. Overall, the Café in the Park is a radical departure from the Arts Lodge of a year ago. The mural on the outside fence has been painted over, there are fewer flowers and plants, and the whole place feels a lot less colourful than before. The refurbishment looks nice, but for me, it just doesn’t have the same energy as before. I wholly support the aims of the new charity operating The Cafe in the Park, particularly as ours is a city with increasing levels of homelessness. However, by placing such strong and consistent emphasis on the former operators being evicted to offer services for people with learning disabilities, Councillor Jones may have made a rod for her own back. Similarly, by insisting that the new facility will bring more people to the park, the council have placed the new operators under unfair and undue pressure, particularly given that there is currently less arts and cultural activity taking place at the site than there was in the hands of the former tenants. At the moment, it’s hard to see how the new cafe will provide the boom in usage to Victoria Park that taxpayers were promised.